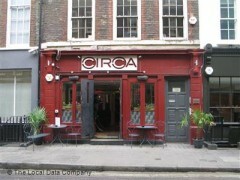 About: Open daily until 01.00am, Circa is a new venue playing pop and mainstream dance to it's largely gay crowds. "Camp meets sleek at new bar Circa"
Circa is the latest addition to Soho’s gay nightlife, a bar that combines the unashamedly camp (like the purple lighting, or the giant mirrorball that incorporates the DJ booth) with the sleek, in the form of metallic bar stools, studded leather armchairs and shiny wooden flooring. It is a breath of fresh air to Soho regulars who have long tired of Ku Bar, The Edge, or dare we say it, the cheese-tastic G.A.Y., plus most of the recent launches of the London gay scene have taken place in the East End. Whether this new Frith Street establishment will go the distance remains to be seen. For now, the music policy doesn’t differ much from its rivals’ with pop and commercial dance tunes; there are regular nights such as Room Service on a Thursday and drag diva Munroe Bergdorf and DJ James Pople turn up to play on Fridays and Saturdays respectively, however it’s open for drinking every day from 4 pm till 1 am. Unsurprisingly it’s at its liveliest at weekends, however it is usually still possible to find breathing space and a seat on a Friday – something unheard of in this part of town. Drinks prices vary; a bottle of Prosecco is a reasonable £20 while a pint will set you back the best part of £4. Beware the precarious winding staircase to the unisex toilets, but most importantly let’s not forget the eye candy behind the bar. Circa is the coolest place and has something to offer everyone, whether early or late, weekday or weekend.